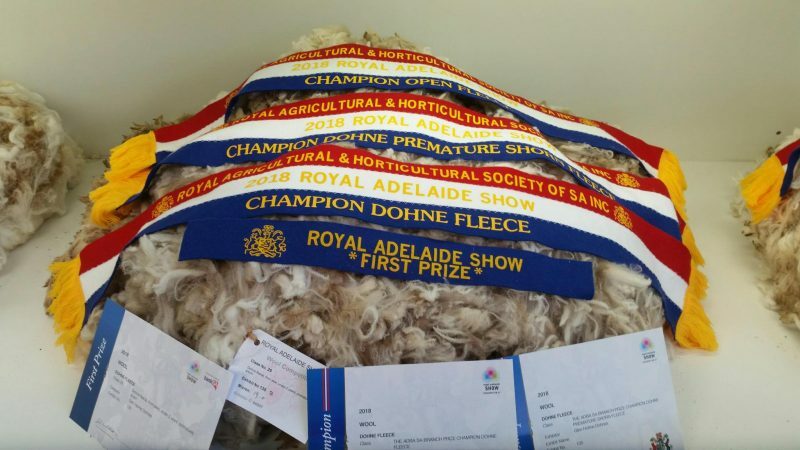 The Dohne Fleece classes at the Royal Adelaide Show received entries from New South Wales and Victoria for the first time. 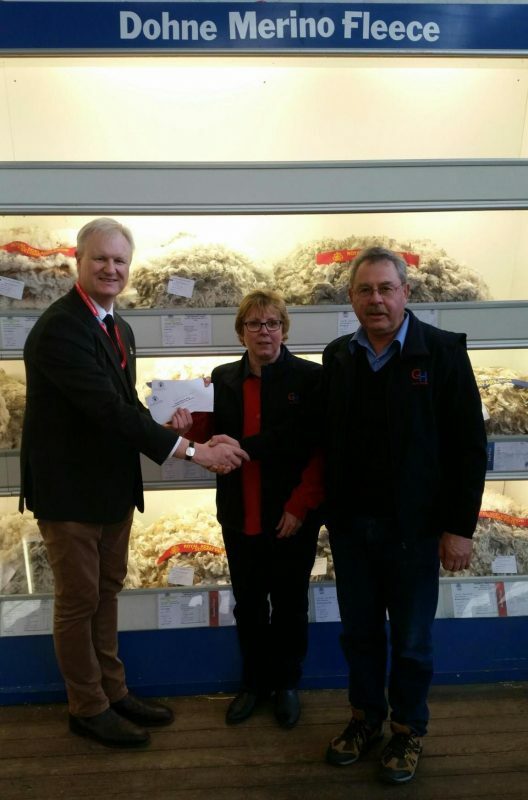 The Royal Agricultural and Horticultural Society of South Australia have generously made a special section of their wool display for Dohne Fleeces. 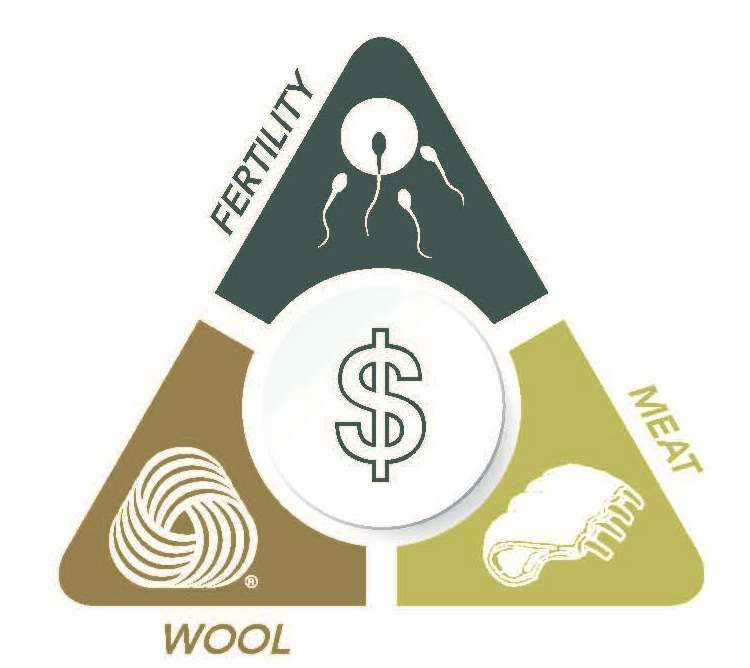 This is a very good way to show wool industry participants the quality and styles of wool that are available on the modern Dohne. The Adelaide Royal is a ten day event, the fleeces are on display for the whole show. Some of the Dohne fleeces have been donated to the Royal Flying Doctor service, as fund raising to support rural and regional Australians who have medical emergencies. Championship winning fleeces are all displayed in one cabinet, allowing the general public to see their quality parameters. 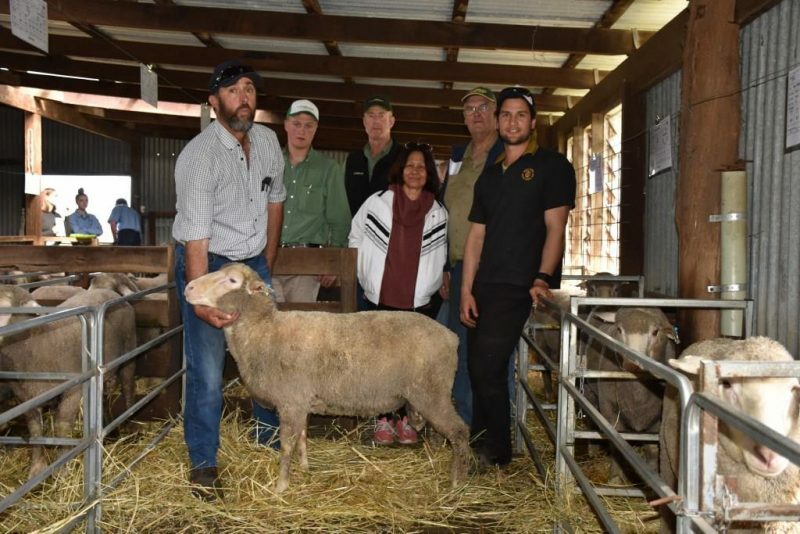 In line with the need for Dohne Breeders to shear young sheep several times in their first two years of age, the RAHS Pastoral Committee facilitates Prematurely shorn fleece classes to suit Industry requirements. 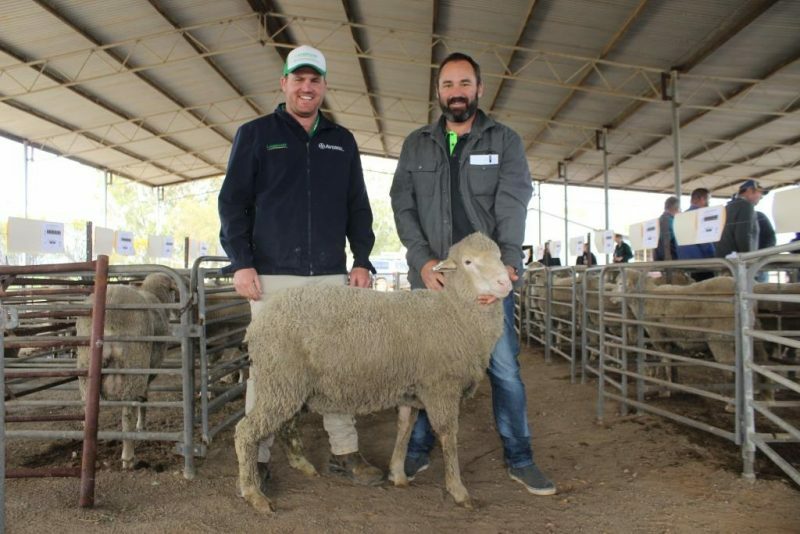 It was a Prem shorn Ewe Fleece that scored the most points, and ultimately became the Champion Dohne Fleece. 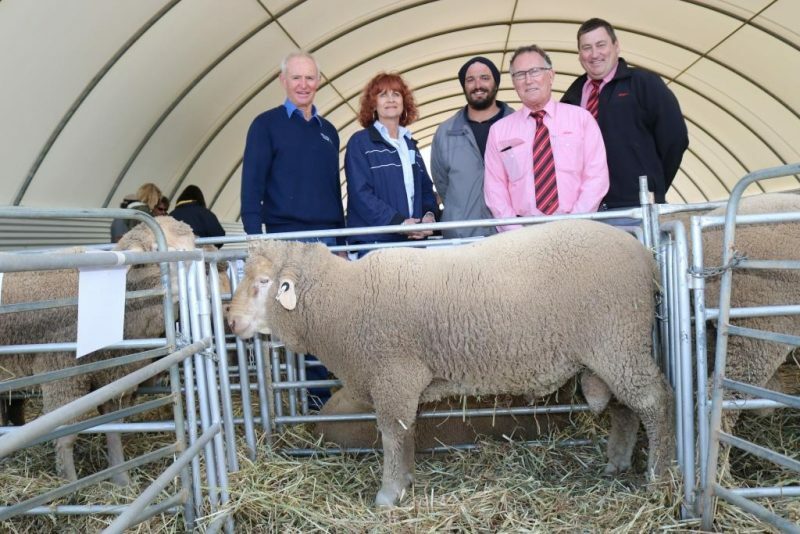 It was exhibited by Allen and Joy Kelly of the Glen Holme Dohne Stud at Manoora South Australia. ADBA Secretary Cameron Hills made the presentation to the Kelly family. Cameron Hill, Joy and Allen Kelly. Thanks from the South Australian Dohne Promotion branch and the ADBA members to all the prize money and Championship donors. Sale photos on behalf of – The Land, Stock & Land, Stock Journal, Farm Weekl. 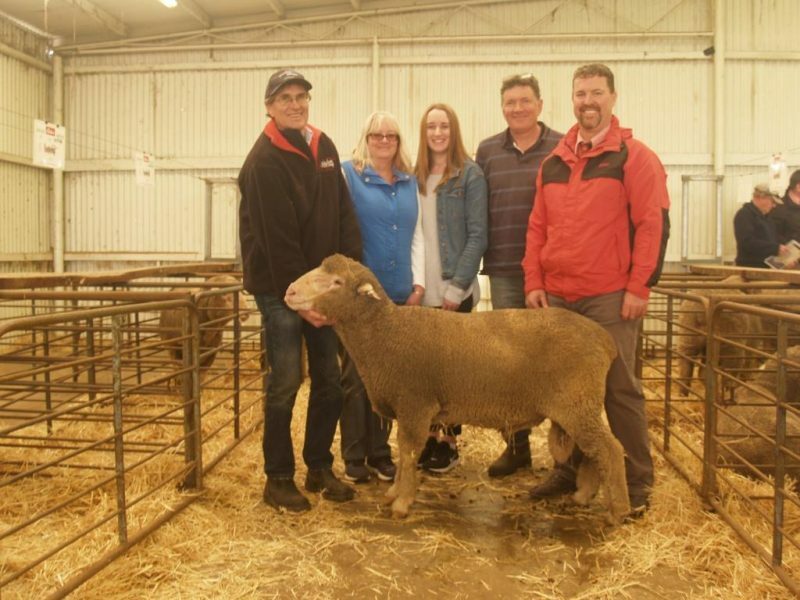 Finley Leach (Glenlea Stud) holding the top priced ram, with him are buyers Suzanne, Danny, Natasha and Simon Chitty of Goomalling, Tom Bowen from Landmark and Glenlea Stud Principal Alex Leach. Ian, Julie and Brittany Hanna, Koobelup stud, buyer Peter McKenzie, Wedgecarrup and Elders auctioneer Nathan King. 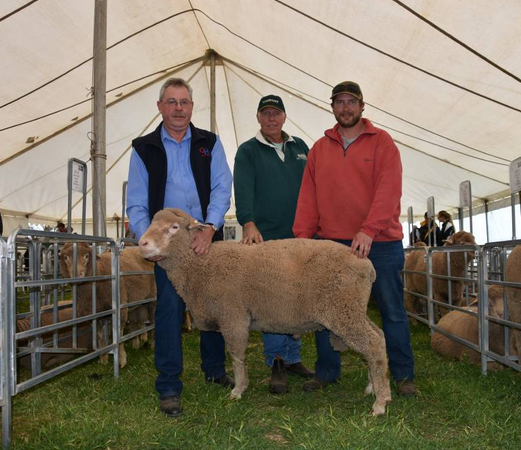 Landmark representative Brice Maddock and Harold Park stud manager Charles Wass with the top priced ram. Stud Principals, Ian Longmuir and Steph Longmuir, Purchaser Rhys Parsons Kintail Park Dohne Stud and Elders Agents Wayne Maher and Tim Spicer. 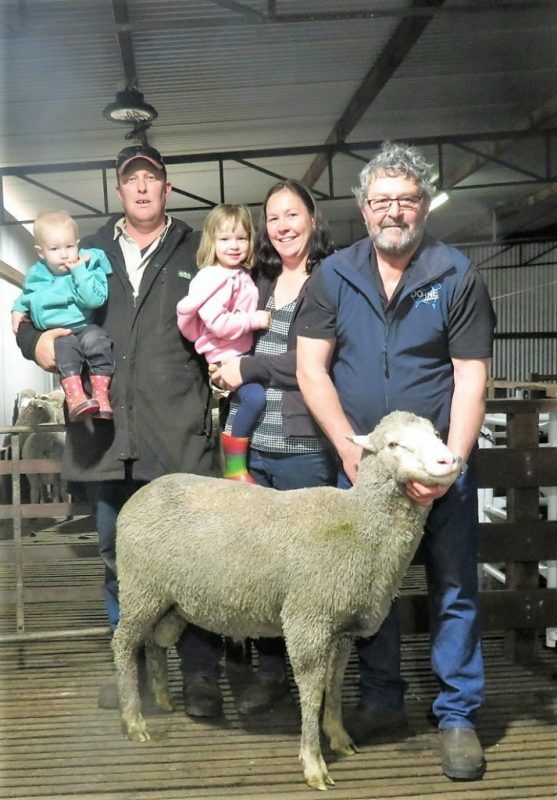 John, Clinton, Hannah and Hayley Graham with Harold Park stud principal Harold Wass with the top priced ram. 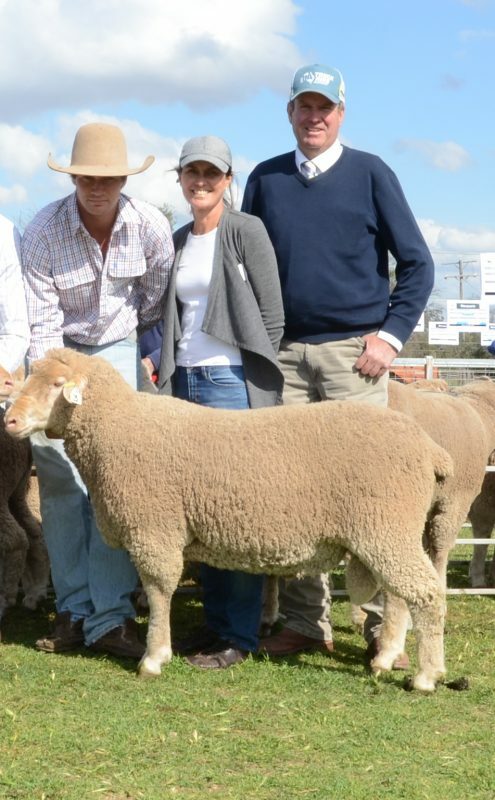 Landmark auctioneer Mark Warren (left), Chirniminup Dohnes stud principal Rachel Browne, and buyer of the top price ram Bevan George, Cuballing. 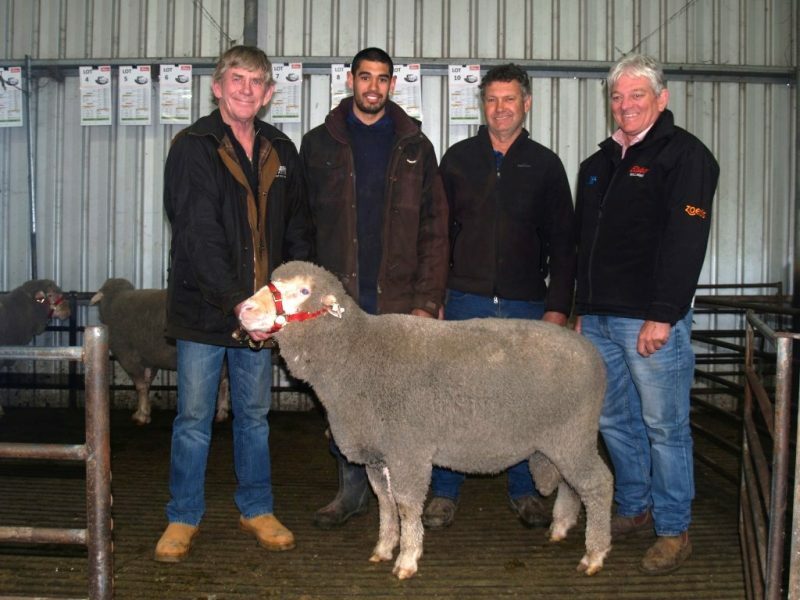 Top price buyer Mark Plunkett (left), with local Landmark representative Neil Foreman and Travis and Rhys Parsons holding the $4300 Dohne that topped Kintail Park’s ram sale. 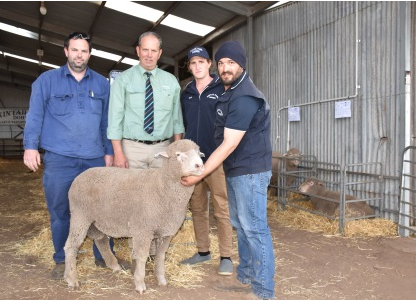 Far Valley stud principal David Kain, buyers Jared and David Robinson, Arthur River and Elders Williams agent Graeme Alexander. 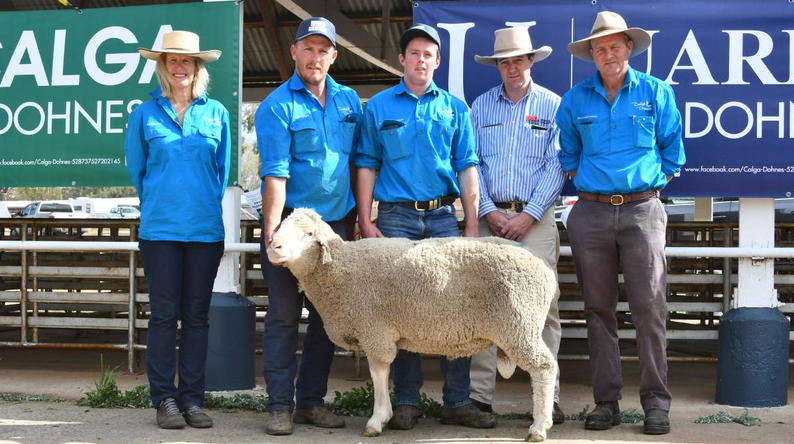 Calga Principal, Margie Pye, Cory Jones, Lachie Corrigan, Auctioneer, Nick Fogarty and Studmaster, Jason Southwell with the top priced ram purchased by Macquarie Dohne Stud. Glen Holme Dohne stud principal Allen Kelly and buyers Noel and Luke Sommerville, Hilltown. 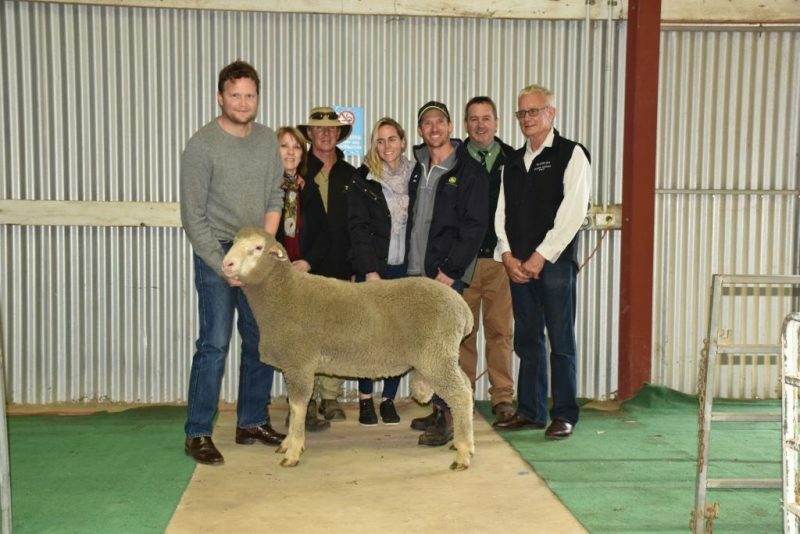 Denvale stud principal Greg Sounness, Landmark Albany trainee Laurence Grant, Landmark auctioneer Charlie Staite, buyers Nora, Graham and Benny Zadow, Broomehill. 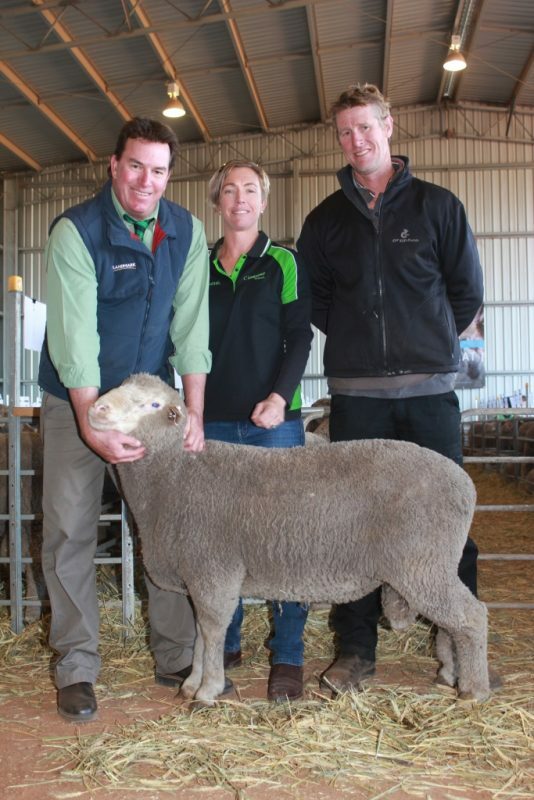 Macquarie Dohne Stud, Will and Robyn Nadin, Auctioneer Paul Dooley, with the top priced ram purchased by Chirniminup Dohne Stud. Kombyana Dohne stud, Wellington, paid $4500 top price. 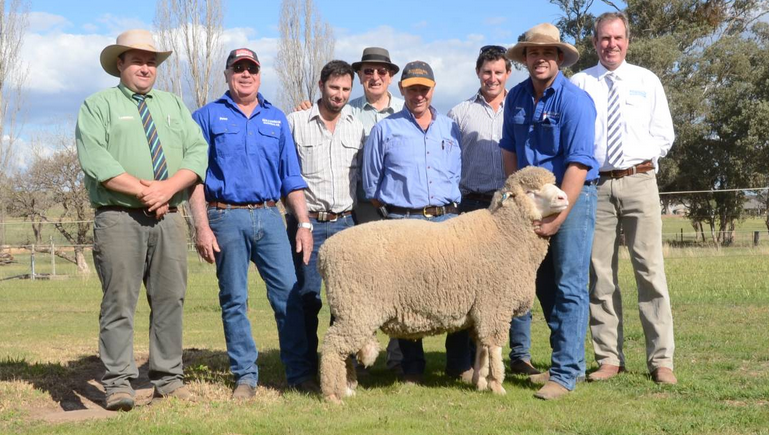 Brad Wilson, Landmark, Dubbo; Peter Hughes, Gullendah; Tim, Peter and Jason Conn with classer, Allan Clarke, Dubbo, Andrew Hughes holds ram, Paul Dooley. Tamworth. 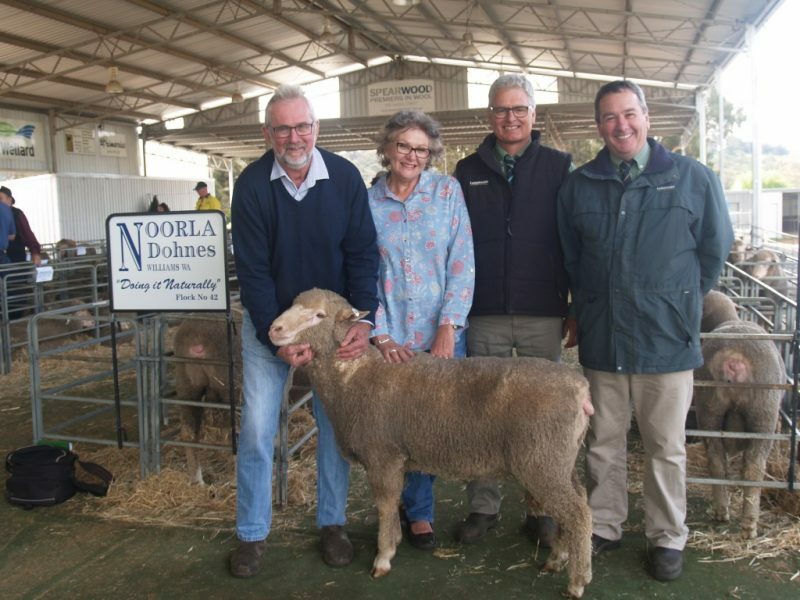 With the top-priced Noorla Dohne ram sold at $3900 bought by Treehaven Farm, Bolgart, were Noorla stud principal Jeremy Genders (left), his wife Julie, Landmark Williams representative Peter Moore and Landmark commercial sheep manager Tom Bowen. Breeders are encouraged to collect blood samples from key sires and dams and send to SG. 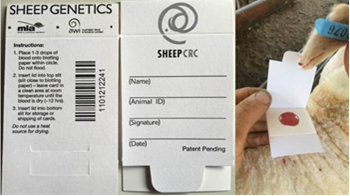 Any sheep can be sampled, but those with tested progeny will yield more rapid genomic results for the breed. Individuals may not see results in the short term, but as a breed society we need to get the genomics to back up our current testing and ensure we don’t get left behind in the technology stakes. Allen Kelly is the contact for more information, his details are on the sidebar. It is important as a breed to promote the attributes of the Dohne and how they perform against other breeds and in different regions. 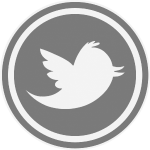 so it can be promoted on the ADBA website and social media. Sheep Genetics (SG) requires all data for analysis to be submitted to them before 5pm on the 7th and 21st of each month, or the Friday before if the 7th or 21st fall on a weekend. Brett needs the data from Dohne breeders three days prior to the SG cut-off date to guarantee, your data goes into the analysis.